On Saturday Jim and I drove out to East Stroudsburg PA to visit the Frank Frazetta museum. 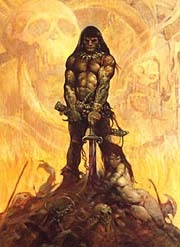 Frazetta’s been a favorite of mine since I was a kid. I don’t remember when I first became aware of him, but I do vividly remember begging my mom to let me buy “The Fantastic Art of Frank Frazetta” when I was fairly young. I never realized there was a Frazetta museum until a few months ago when I finally got around to watching Painting With Fire, the Frazetta documentary, which mentioned it in passing. I immediately said, “OK, I’m going!” The museum is curated and managed by Frank’s wife Ellie. Although we were disappointed not to meet the man himself, she took the time to meet each visitor personally and told some interesting and funny stories about some of the paintings. The museum is quite small (this image shows about 75% of it) but it’s an inspiring sight. To stand in front of a single Frazetta painting from only a foot away is fantastic, and to see them all at once is almost overwhelming. It was hard to keep from running all over the place going “There’s that one! Ooo there’s that one!” Although I have several books of his work, I was surprised to see how much detail is not reproduced in print. The makeup on the Egyptian Queen, the scars on Conan’s face, were so incredible. As sort of a funny side note, seeing all these paintings in one place made me realize something: Frazetta doesn’t draw feet! I forget at what point it dawned on us, but as we moved from painting to painting we started to laugh, “Yep, no feet on that one either!” Of course there are some that have feet, and they are certainly well-rendered (so it’s not like he can’t draw feet obviously) but time after time the feet were hidden behind trees, under water, buried in snow, in stirrups, obscured by piles of bodies, etc. Take a look at a bunch of his paintings and you’ll see what I mean! Anyhow, the museum is open Saturdays and Sundays. If you are a fan and in any way able to make it out there, take the trip and you won’t regret it. Excellent… I’m sure the depth of the paintings really come out when you see them in person. What’s the media he primarily uses? I think the most interesting thing for me was seeing the difference in quality between his personal work, (E.g. 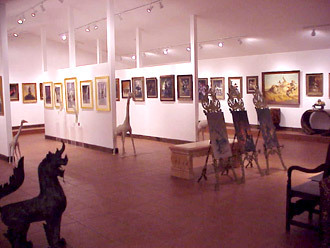 the Africa paintings) and the commercial. There were lots of little mistakes and artistic “cover ups” in the book covers that you will never see when shrunk down and reproduced. And not just the feet. But his personal work on the other hand was almost perfect. It’s in those paintings that you can see his true genius.